BULAWAYO , Jan 26 2012 (IPS) - From downtown shops that stock cheap clothing and shoes that fall apart after one wear, to mining concessions in platinum, gold and diamonds – the Chinese finger is now in virtually every Zimbabwean pie. From city sidewalks to low-income suburbs, the Chinese have become part of the local population, and if some senior government bureaucrats have their way, the country could soon find itself adopting the Chinese Yuan as its official currency. For some influential monetary policy czars, the massive assailing of the Zimbabwean economy by the Chinese now only requires the Yuan to strengthen these economic reconstruction efforts. Invited by President Robert Mugabe as part of his infamous 2004 “Look East” policy to participate in driving the economy and employment creation, after relations with former traditional investment partners the European Union and United States soured, China has been able to create its own little sphere of influence and establish an ubiquitous presence in Zimbabwe. This is despite being unpopular with Zimbabwe’s industrial and commercial players, and general members of the public who accuse the Chinese of poor labour practices and shoddy goods and services. Late last year, Reserve Bank governor Gideon Gono, seen by many as a close ally of Mugabe, announced he was in favour of having the Chinese Yuan as the country’s official currency. 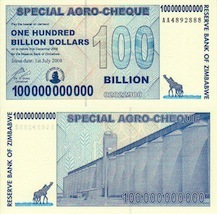 After the Zimbabwean dollar was suspended in 2008, the country has been using a multi-currency regime, which includes the use of the U.S. greenback, the South African Rand and the Botswana Pula. According to Gono, the Chinese Yuan would be introduced alongside the Zimbabwean dollar. Mugabe’s political supporters have been calling for currency reforms to bring back the Zimbabwean dollar. “With the continuous firming of the Chinese Yuan, the U.S. dollar is fast ceasing to be the world’s reserve currency and the Euro-Zone debt crisis has made things even worse. As a country, we still have the opportunity to avoid being caught napping by adopting the Chinese Yuan as part of consolidating the country’s “Look East” policy,” Gono told state media in November last year. “It’s only recently when we had the startling revelations with Angola offering to bail out her former colonial master Portugal from her debt crisis. This can also happen with Zimbabwe if we choose the right path,” Gono said. Mugabe’s Zimbabwe African National Union – Patriotic Front officials see huge potential in using the Yuan, citing the growth of the Chinese economy under BRICS, which brings together emerging global economic powerhouses Brazil, India, China and South Africa. But not everyone is as upbeat about such prospects. There are concerns that this could mean “handing over” the country to the Chinese who already have been offered huge mining rights by Mugabe despite protests from his coalition government partners. The country’s Finance Minister Tendai Biti has said that Mugabe is forfeiting state resources to China, whom critics are calling Africa’s new coloniser. Economist Eric Bloch told IPS “it is not practical” for Zimbabwe to adopt the Chinese Yuan. “Zimbabwe won’t have any interaction with international markets as the U.S. dollar remains the standard currency in international trade,” Bloch told IPS. With China increasingly being touted to overtake the U.S. as the world’s largest economy, the temptation to embrace all things Chinese has proven too much to resist for poor economies across the globe, contends Tafara Zivanayi, an economics lecturer at the University of Zimbabwe. “There has been false hope given to Chinese economic growth with many African countries imagining they can transfer this growth to their own economies,” Zivanayi told IPS. “Such decisions (to adopt a foreign currency) as usually based on international trade indices and monetary policies of the country where the currency is domiciled. Even if there have been projections that the Chinese economy will surpass the U.S. economy, this won’t happen overnight,” Zivanayi told IPS. “There are still concerns about Chinese penetration of international, especially low income, markets and creating wealth for itself and not host countries,” Zivanayi said. Even traders who have long ridiculed cheap Chinese products and have no grasp of international trade intricacies find themselves offering opinions about the prospects of adopting the Chinese Yuan. Zimbabwe does not have coins of the various currencies and shops and retailers struggle to give their customers change. Gono and other opponents of the US greenback cited this lack of change in coins as a reason why Zimbabwe needed to adopt a single currency or revert to its own, useless dollar. However, during the presentation of the national budget for the 2012 fiscal year, Biti told parliament that Zimbabwe would continue using the dollar until the economy stabilised. Not everyone supports the introduction of the Chinese Yuan. “We want real money, not zhing-zhong,” taxi driver Jourbet Buthelezi told IPS, referring to the pejorative term Zimbabweans use for sub-standard Chinese goods.